Abstract : In image-guided percutaneous interventions, a precise planning of the needle path is a key factor to a successful intervention. In this paper we propose a novel method for computing a patient-specific optimal path for such interventions, accounting for both the deformation of the needle and soft tissues due to the insertion of the needle in the body. To achieve this objective, we propose an optimization method for estimating preoperatively a curved trajectory allowing to reach a target even in the case of tissue motion and needle bending. Needle insertions are simulated and regarded as evaluations of the objective function by the iterative planning process. 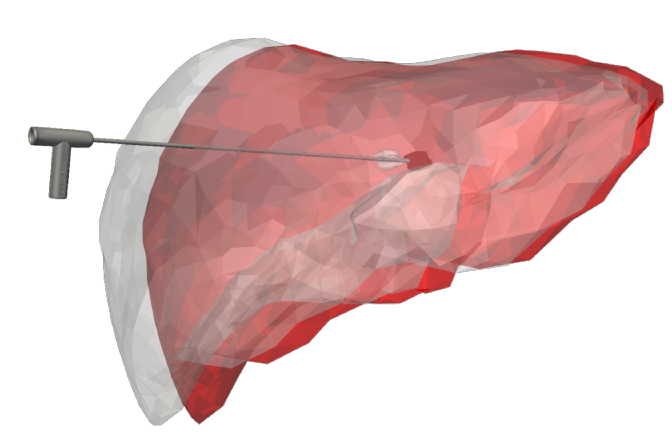 In order to test the planning algorithm, it is coupled with a fast needle insertion simulation involving a flexible needle model and soft tissue finite element modeling, and experimented on the use-case of thermal ablation of liver tumors. Our algorithm has been successfully tested on twelve datasets of patient-specific geometries. Fast convergence to the actual optimal solution has been shown. This method is designed to be adapted to a wide range of percutaneous interventions.